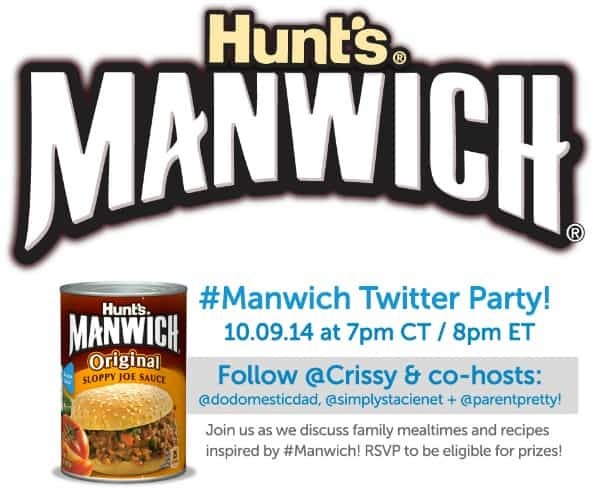 Join the #Manwich Twitter Party on 10/9 at 8 pm EST! Warning: you may leave this Twitter party hungry! You are invited to join the #Manwich Twitter party on October 9th at 8 pm EST where we’ll be chatting about the importance of family mealtimes and sharing yummy recipes inspired by Manwich. I always think of comfort food when I think of Manwich and am looking forward to hearing about your favourite recipes! Please retweet this tweet and add your Twitter name to the linky below! NOTE: The “your name” field should be your Twitter handle (i.e. @Crissy), and the “your URL” field should be your Twitter URL (i.e. http://twitter.com/crissy/”). You must be present and active at the party to win. Looking forward to the twitter party! I love me a yummy Manwich. This should be a fun party! This is going to be one awesome party!!! and manwich’s are the bomb!! Manwich oh i love you !! I don’t use twitter, but we are fans of Manwich! Good luck to all, and have fun! In our house, we call them “Messy Giuseppe’s”! Can’t wait for this party! Wonderful EATernet chat ahead look forward to it! Thank goodness it’ll be dinner time here! Love Manwich. So yummy and so easy to use. There are a variety of ways to use it, too. My daughter recently made a sloppy joe stir fry using it. I have been “looking” forward to this all week.